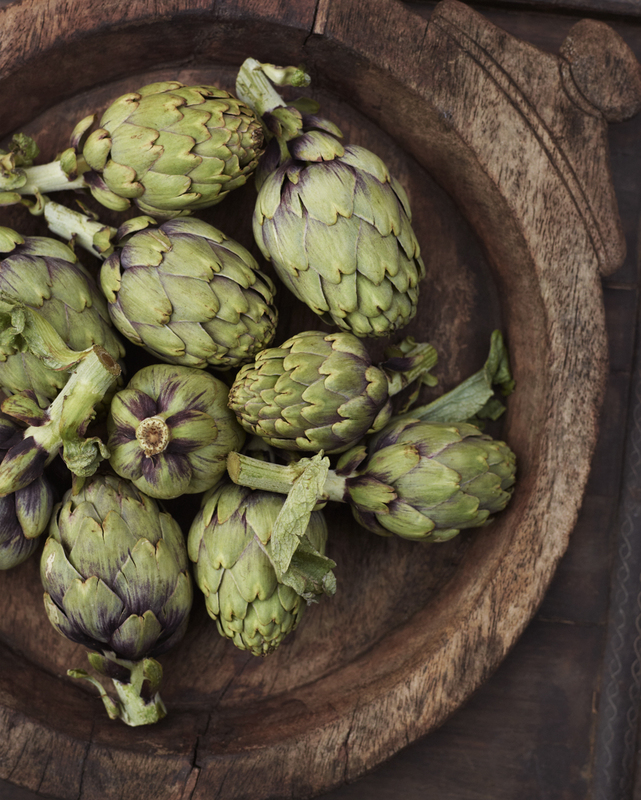 The season for artichokes is here! I just love them. I cook them many different ways. This recipe is my best, and it’s very simple to make. 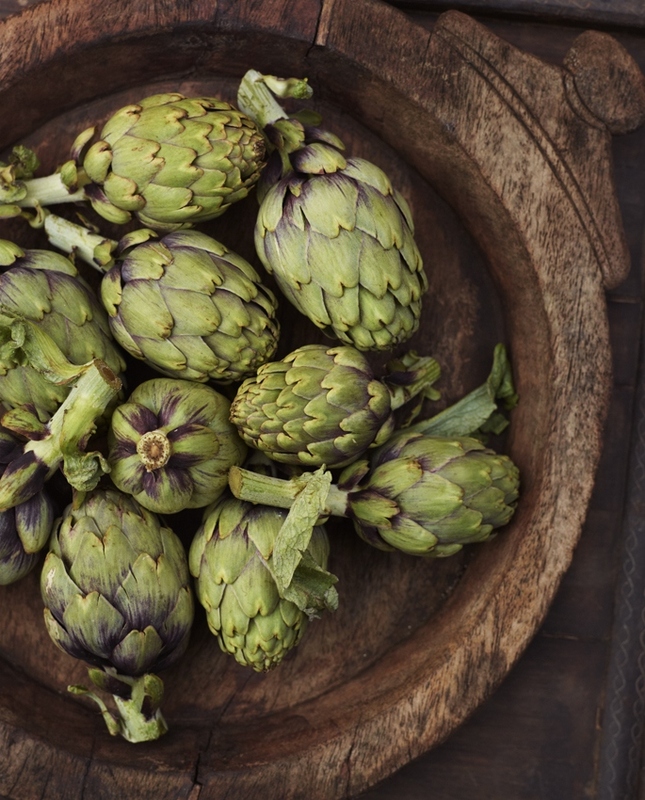 There are several varieties of artichokes. 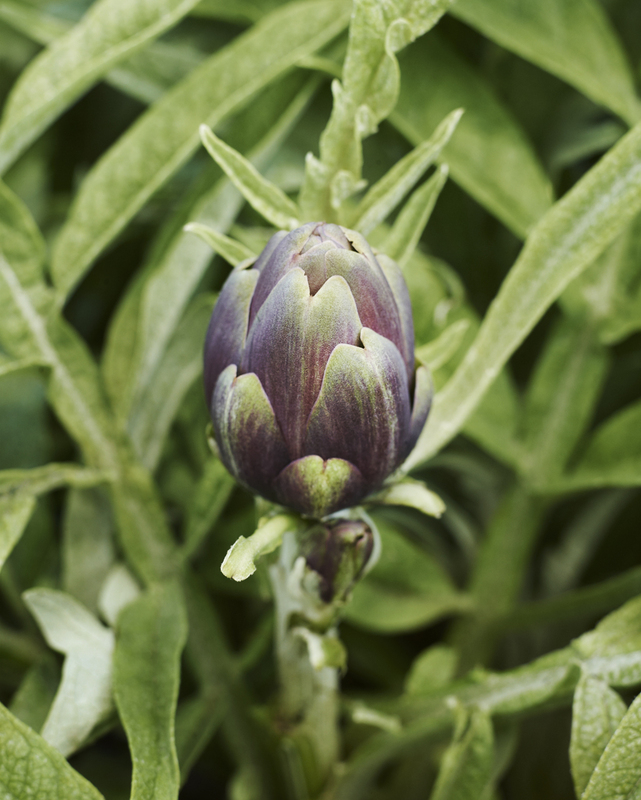 If you can find baby artichokes, they don’t contain the choke and are more tender, so the preparation will be shorter. If you are using the larger varieties you will have to remove the beard, or the choke, the hairy internal area found just above the heart as well as all the tough outer leaves. Either way, all efforts related to artichoke preparations are always worth the effort. This dish is perfect as appetizer, antipasto or as an accompaniment to grilled fish or chicken. 1 large pot 5 cup (1.18 liters) capacity or more with lid large enough to accommodate 3 cups (7 dl) water and 1 1/2 cup (3.5 dl) olive oil for cooking of the artichokes. Placed on a medium burner and bring to a boil. Lemon wedges and fresh herbs for garnishing the platter. Clove, peel and mince the garlic. Place the kosher salt on top of the garlic and using the side of your knife work the salt and garlic together into a paste. Remove the stems from the herbs and mince. In a bowl combine 1/4 cup (0.6 dl) of olive oil, all lemon juice with the herbs and garlic salt to make the artichoke rub. Rinse and clean each artichoke. Remove any outer leaves which appear to be sad, dry or cracked particularly near the stem. Use a scissor to remove any tips of the out leaves that contain a thorn. 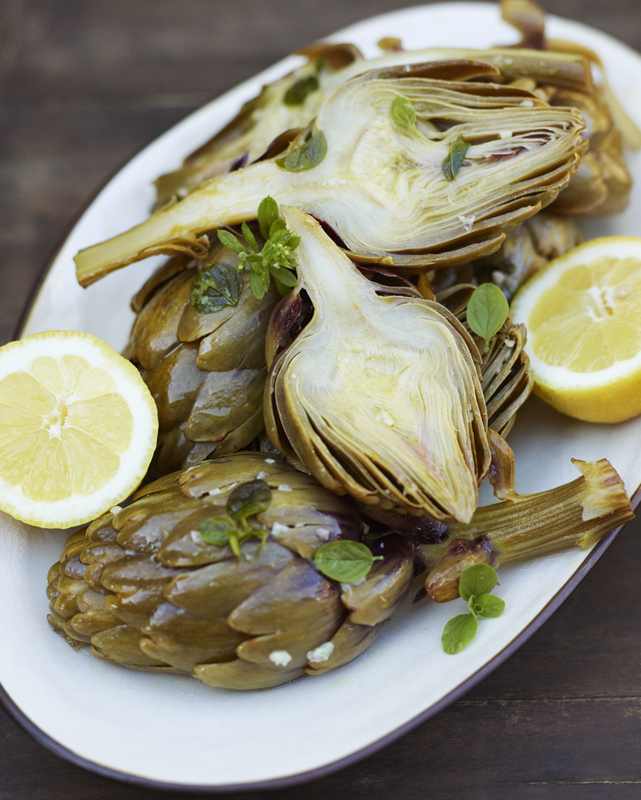 NOTE: Use only stainless steel knives or scissors when working with artichokes! High carbon knives react chemically with artichokes, any artichoke surface they come into contact will turn black. If you are using baby artichokes cut the artichokes in half, should you be using the larger variety of artichokes, cut them in quarters. Remove the beard, the fuzzy hairs located just above the artichoke’s heart, this is easily down with a teaspoon. You need to work fast for artichokes oxidizes and change color. Lemon juice will help prevent this, so rub the whole artichokes thoroughly with the artichoke rub, and don’t forget to get in between the leaves. Add artichokes into the pot that has water and olive oil boiling. Go ahead and toss any extra artichoke rub into the pot as well. Lower the heat to allow the artichokes to simmer. The liquid should just cover the artichokes, as a thumb rule, one part olive oil with 2 parts water. Let them simmer about 15-20 minutes, if you have the larger type of artichokes you probably will need more cooking time. To check if the artichoke is ready, pull a leaf close to the center, if the leaf come off easily, it’s done. If not, cook more and check every 5 min, if you have the really big artichokes the cooking will be about 40 min. When it’s ready, let cool slightly in the broth, eat them lukewarm or cooled. To serve, choose a high lipped or edged platter. Arrange the artichokes in the center of the platter and drizzle some of that beautiful broth over the artichokes. Garnish with fresh herbs and lemon wedges. Serve with bread to soak up the good broth. This entry was posted in Appetizer Recipes and tagged Anna Huerta, Artichokes, garlic, lemon, olive oil, Pantelleria, Sicily on April 15, 2013 by Anna Huerta.